People of ancient India planned Festivals in a manner that man can get sheer pleasure and enjoy life to its full, so that he may retain his spirit throughout the year. The festivals and celebrations in our country reflect the very Indian culture and identity of our country. The entry of the sun in the tenth sign of Zodiac (Capricorn) is known as Makar Sankranti. 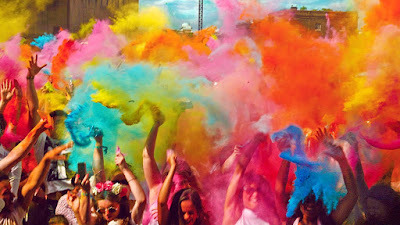 According to Indian astrology, this phenomenon is known as 'Uttarayan', as it occurs in the north direction. This festival is celebrated as the kite-flying day. All Amdavadis enjoy kite flying. 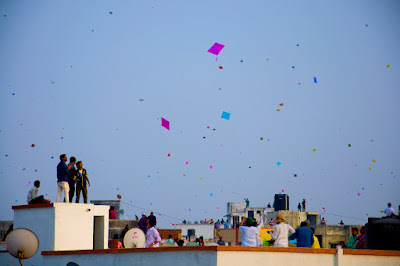 The number of kites flying in the sky of Ahmedabad is more than that of the kites flying anywhere in the world. On this occasion, special foods like Undhiyu and Jalebi are enjoyed by all. At night, they fly kites with paper lamp (Tukkal) attached to it. Gujarat Tourism Corporation has been celebrating International Kite Festival since 1989. It is celebrated during the month of March or April. 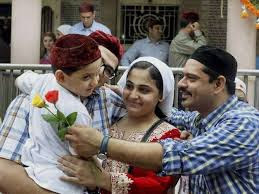 The Sindhi community in the city celebrates Cheti Chand - in the month of Chaitra, enthusiastically. It is the birthday of their windgod, Zulelal and the first day of Sindhi calendar year. A procession of Zulelal is led through the city. It is celebrated during the month of July or August. The Jagannath temple of Ahmedabad is famous for Rathyatra in Gujarat. On this day,the entire town is busy with the celebration of Rathyatra. Mahant Shri Narsinhdasji Maharaj started the tradition of Rathyatra on the second day of the bright half of the month of Ashadh in 1878. Since then, the tradition of Rathtyatra is continued. There are three chariots in the Rathyatra. The first chariot is of Lord Jagdish, the second of Subhadraji and the third of Jagdish's elder brother Balram. The procession of all the three chariots is led through the fixed route of the walled city and its outskirts. The devotees put on 'Uparanu', an apron of saffron colour as a sign of grace of the lord. Sprouted Mung and Jamuns (Rose Apples) are distributed as prasad. There are demonstrations of acrobating by the Akhadas, (traditional athletic clubs) during the Rathyatra. Many groups sing devotional songs and the musical bands accompany the Rathyatra. We may see trucks loaded with people. Rathyatra takes 12 to 16 hours to cover the distance of 20 km through the fixed route. The citizens of Ahmedabad consider this day to be very auspicious. The last day in the Parsi calendar is Pateti. On this day, all the people of Parsi Community of the city go to their temple "Aatash Deh", where they worship the holy fire. The day after Pateti is celebrated as "Navroz", the first day of the new year. It is celebrated during the month of August or September. The Jains keep themselves busy in worshipping God from the 12th day of the month of Shravan to the 4th day of the bright half of the month Bhadra (Bhadarva). The jain sadhus and jain sadhwis carry on religious discourses in the Upashrayas and the devotees listen to their religious discourses and contemplate over them. On the third day of Paryushan, a procession of Kalpasutra is arranged from among the five principles. The principle of Amari (non-violence) is given much importance. 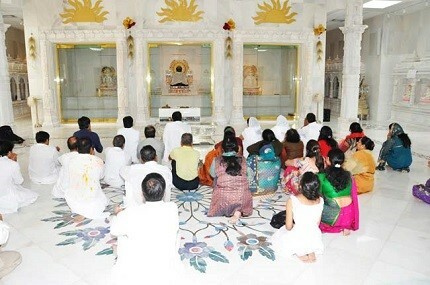 The Jains observe fasts during Paryushan. 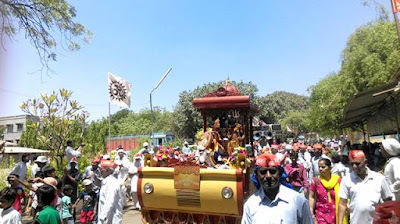 The last day is called Samvatsari and all the Jains greet one another with the words "Michchha-mi-Dukkadam". They ask for each other's forgiveness by these words if they have offended anyone during the year by words, action or deed. The Digambar Jains celebrate Paryushan from the 5'th day of the bright half of Bhadra for ten avs. It is celebrated during the month of September or October. Navratri is the festival of worshipping Goddess of Power (Shakti) for nine days from the first day of the month of Aaso. 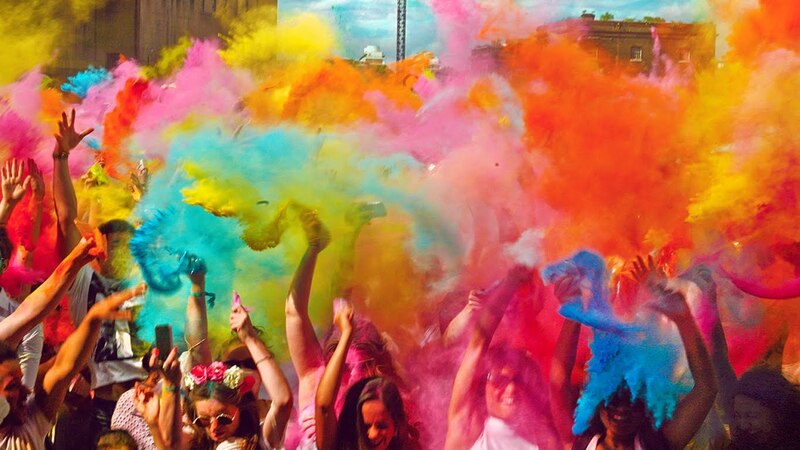 This festival is pompously celebrated with dance. 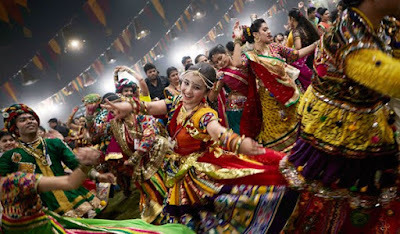 Navratri is considered as World's longest dance festival. The Bhadrakali temple and Ambaji temples at Madhupura, Dhana Suthar's Pol and Memnagar's Manav Mandir are of great importance,' which are flooded with the devotees during Navratri festival. The Raas-Garba dances to the tune of the drum beats is Navratri. 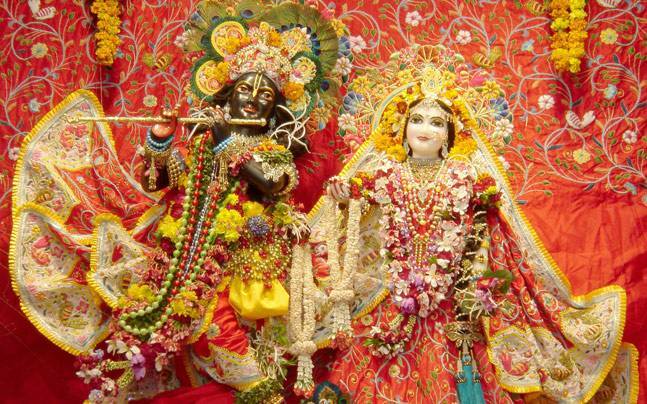 We observe the youthful spirit with full bloom during Navratri. 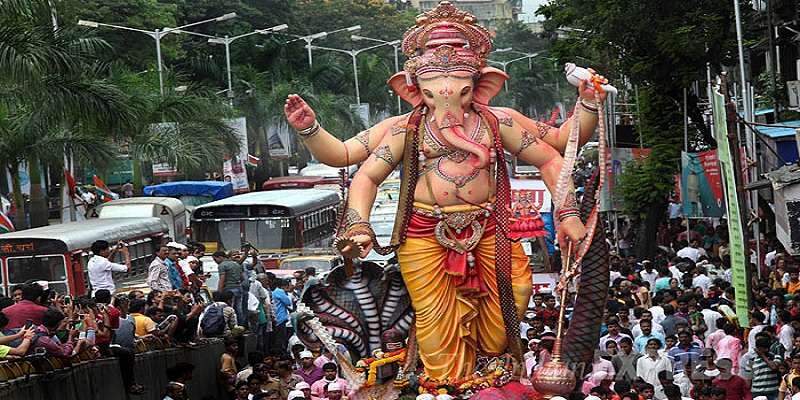 The 10th day is celebrated as 'Dashera', in the honour of the victory of Lord Ram over Ravan. On this day, Amdavadis enjoy Jalebi and Fafda dishes. It is celebrated during the month of October or November. The festival celebrated from the 12th day of the dark half of the month of 'Aaso' (Vagh Baras) to the second day of the bright half of the month of Kartik (Bhai Bij) is known as Diwali in India. As per the popular belief, Lord Vishnu killed the demon in the form of a tiger on that day. Therefore, it is known as Vagh Baras. The next day is known as Dhan Teras. On this day the goddess of wealth (Laxmi Devi) and Kuber (God of wealth) are worshiped ceremoniously. The day after that is celebrated as Kali Chaudas. Worship of Goddess Kali keeps all types of evils away. 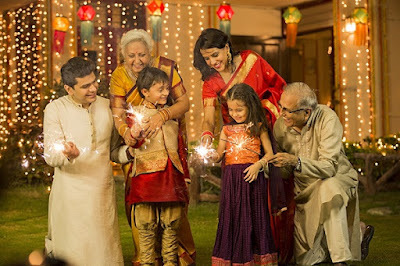 Diwali is celebrated on the last day of the month of Aaso. As per the story in the Puranas, when gods and demons churned the ocean, the goddess of wealth emerged from the ocean on the day when Diwali is celebrated. Businessmen worship their books of accounts on this day in the auspicious hour of the day. The festival is celebrated with lights. Each home glows with lamps. Children and even the adults, light fire crackers. There is joy everywhere on this day. The new year day is the day of highest joy for every citizen of India. According to Hindu calendar, the first day of the bright of Kartik is known as the new year day of Vikram Era. 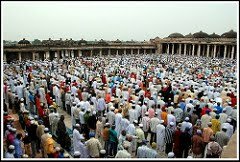 The citizens of Ahmedabad start their daily routine after worshiping the Goddess. They go to their relatives to greet and wish a happy new year. People buy new clothes, crackers and sweets to celebrate Diwali festival. The Vaishnavas celebrate this day as the festival of Annakut. The day next to the new year day is known as Bhai Bij. After enjoying Diwali festivals cheerfully, people start their work from Labh Pancham, the fifth day of the month of Kartik. It is celebrated from December 25 to January 1. The celebrations of Christmas begin on 25th December. 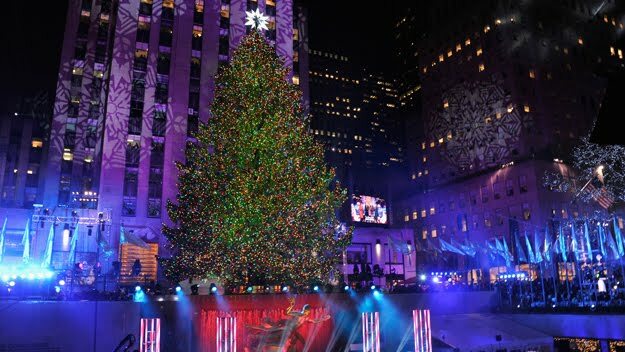 The city glows with Christmas trees and lightning all around. These days, children have a great attraction for Santa Claus, with a white beard in red clothes and a red cap on his head. Christmas is the greatest festival of the Christians. During Christmas; they visit the Churches and pray to God for their well-being. The night of 31st December is almost a night of music, dance and merriment. Then 1st January is celebrated as a New Year Day. The city indulges in the celebrations of the New Year day enthusiastically. According to Islamic calender, Moharrum is the first day of the Islamic year. This festival is celebrated as the martyrdom of Hazarat Imam Hussain, Grand-son of the prophet Mohammed Saheb. The muslims recall the martyrdom of Imam Hussain and pay homage by leading a procession with `Tajiya`. 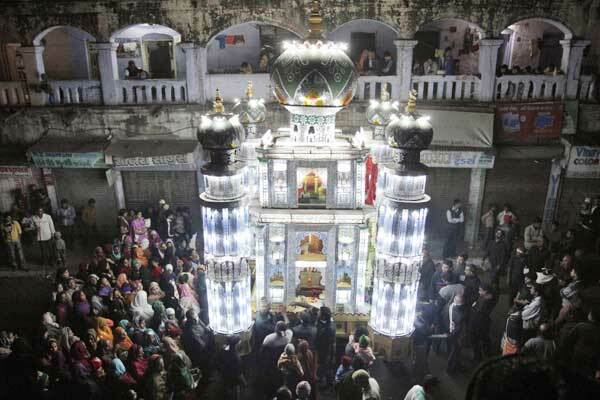 The muslims celebrate the previous night of the tenth Moharram as the `Night of Martyrom (Katal-ki-raat)`. 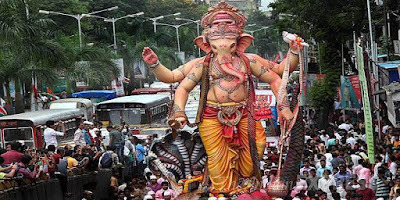 Other festivals like Holi, Dhuleti, Ramzan Eid, Ganesh Utsav and Janmashtami are celebrated in the city with great fervor and pleasure.